O disciple of Dewi Sant,/ flower of the wilderness and teacher of the young,/ holy Schotin,/ in thy life thou didst serve Christ alone./ Wherefore, O Saint, intercede for us,/ that following thee in all piety and godly quiet,/ we may attain eternal salvation. Praising thee and glorifying thy memory, O holy Schotin,/ we make our prayer to Christ our God,/ that He will grant us grace to emulate thy example,/ serving His holy Church and striving for the advancement of His kingdom. When our Lord reached thirty years from His physical birth, He began His teaching and salvific work. He Himself signified this "beginning of the beginning" by His baptism in the Jordan river. St. Cyril of Jerusalem says, " The beginning of the world - water; the beginning of the Good News - Jordan." At the time of the baptism of the Lord in water, that mystery was declared to the world: that mystery which was prophesied in the Old Testament; the mystery about which in ancient Egypt and India was only fabled; i.e., the mystery of the Divine Holy Trinity. The Father was revealed to the sense of hearing; the Spirit was revealed to the sense of sight, and in addition to these, the Son was revealed to the sense of touch. The Father uttered His witness about the Son, the Son was baptized in the water, and the Holy Spirit in the form of a dove hovered above the water. When John the Baptist witnessed and said about Christ, "Behold, the Lamb of God, Who takes away the sins of the world" (St. John 1:29), and when John immersed and baptized the Lord in the Jordan, the mission of Christ in the world and the path of our salvation was shown. That is to say: The Lord took upon Himself the sins of mankind and died under them [immersion] and became alive again [the coming out of the water]; and we must die as the old sinful man and become alive again as cleansed, renewed and regenerated. This is the Savior and this is the path of salvation. 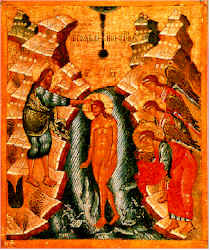 The Feast of the Baptism [Theophany in Greek] is also called the Feast of Illumination. For us, the event in the Jordan river illuminates, by manifesting to us God as Trinity, consubstantial and undivided. That is one way. And, the second: everyone of us through baptism in water is illumined by this, that we become adopted by the Father of Lights through the merits of the Son and the power of the Holy Spirit. All that You create by Your Word, by Your Spirit You consecrate. For the world You walk to Your death; for the world, You resurrect. Father, Son, Holy Spirit - God, have mercy on us!